Corps Security has announced its intention to support the Commando Spirit Appeal on behalf of the Royal Marines Charitable Trust Fund (RMCTF) and raise £45,000 over the next three years. As one of the leading armed forces charities, RMCTF works to support those wounded and injured, as well as those still serving, by funding decompression activities, homecoming events and memorials. It also provides through-life support to those who have left the Royal Marines or have lost loved ones in service. Over the next 18 months more Royal Marines than ever will be operationally deployed – 75 per cent of those serving. They will work in dangerous and difficult circumstances, leaving their loved ones behind, risking injury and their lives. To reach the target, members of staff are taking part in the Commando Spirit Series of events, beginning with Escape the Dunker, in September. This will see a group of brave challengers take on the infamous Dunker – a tough Royal Marines training exercise which simulates a helicopter crash at sea. 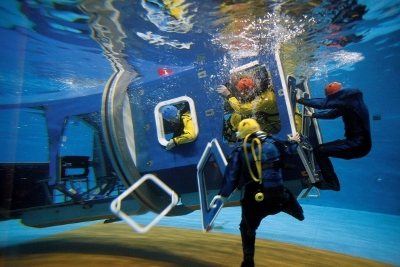 They will be strapped into a mock fuselage and thrust into water, in the dark and at great speed until completely submerged, escaping only by using the correct procedure. As well as the Commando Spirit Series of once-in-a-lifetime challenges, Corps Security staff are being challenged to take on their own fundraising activities and events such as sponsored abseils and walks. Anyone wishing to donate can do so via Corps Security’s JustGiving fundraising page at www.justgiving.com/teams/corps-security.